An exhilarating children’s concert for the adventuresome at the “summer colors”: Peter Schindler and the “kleine Kantorei” (small choir) go full steam ahead. For children who, in anticipation of their summer break, have already caught the holiday fever, yesterday afternoon, there was certainly no better place to be than the Herrenberger Marktplatz (the Market Place in the city of Herrenberg). At exactly two o’clock, the adventure-train stopped at the Herrenberger Marktplatz – at \ the Kulturfestival “Sommerfarben” (Culture Festival “Summer Colors”). With loud hissing and stomping and active participation from the audience, the musicians and choir arrived – zigzagging up the steps and leaping onto the stage and taking with them all those in the audience who wanted to join in on the trip. After the conductor invited all of the adventuresome kids to jump on board, the train continued along on its journey with unabated tempo. There was no possibility for boredom in this one-hour program. There was simply too much to listen to and see. And the best thing about it was that no one had to content themselves with just sitting still and watching: everyone could join in. With great enthusiasm and flair, Peter Schindler quickly ran through the text and melodies with those who did not already know the songs, before the train took off again for the next leg of its journey. Those who joined in met a lot of interesting personalities and got to travel to far away places, places that can only to be reached in a world of make-believe. They arrived in Rumbaland and met King Punimo, who always got annoyed about the weather, until one time, he was allowed to decide whether it should be rainy or sunny. They met up with a small hen that flew around the world alone without any money and experienced a whole array of adventures on her journeys. But adventures can also be dangerous, as the song about the small red balloon showed. Every song told an interesting story. The children learned about how a hippopotamus turned into a rhinoceros, how a jungle party sounds and how many animals can fit onto the back of a crocodile. Everyone had great fun when they all got to dance a “Käsepolonaise” (a cheese conga line) together with a silly band of mice. It was difficult to say who on this fantastic trip of adventures had more fun – the audience or the performers. When they took their leave of the stage, they were followed by Christa Feige with a group of seven to-eleven year-old singers from the kleine Kantorei, who got just as much enjoyment out of playing music as Hans Dampf, alias Peter Schindler. Schindler accompanied the young singers on the piano as they sang pieces that he had composed. Christopher Sauer on bass and Till Müller-Kray on percussion operated alternately like the reposing pistons of an orderly steam-train engine. In the end everyone was happy: the audience, the singers, the director and the Stuttgart composer, Schindler, whose clear aim it is to introduce children to music in the best possible way. Certainly, after the journey at least a few of the children pricked up their ears. Time and again, the soloists climbed up on stage happy-go-lucky. They took on the roles of the characters that the book and pictures had set out for them. 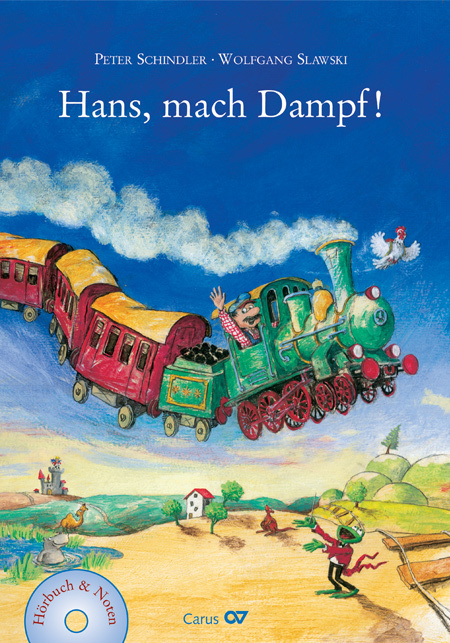 Scenes and melodies out of the fairy tale world of Hans, mach Dampf! (Hans, full steam ahead!). The steam hissed out of the train. A dissatisfied King Punimo sat on his throne and moaned. From time to time a small hen clucked. Then, in the Fat Dog Bar, the sheriff threw the guests off their stools. In Froschkonzert (Frog Concert), everyone leapt up and down and the jungle really came to life. From the very start, the spirited piece Hans, mach Dampf! (Hans, full steam ahead!) by Peter Schindler and Wolfgang Slawski stimulated the children with its witty jesting and ever changing music and spurred them on to be their most creative. Of course, when it comes to a journey around the world, adventure is included in the price of the ticket. That’s why the crowd of children sang about a red balloon that got stuck in a cactus while trying to get in through the train window. The next stop on the journey was Sankt Ottilie. On the steps of the herb-garden, those who had joined on the train trip heard the tale of Dr Peter Silie. Then a very hot wind filled the train compartment. The children moaned under the heat and sang about a small but dangerous crocodile in the Nile. Looking out the window, the young travelers could see huge blooming cacti, and the train approached the Wild West, where dangerous groups of bandits plied their dreadful trade.